The TLS (Transport Layer Security) protocol secures HTTPS and its first version dates back to 1999. It's a successor to SSL 3.0 which was published in 1996. SSL (any version) is not supported by browsers for more than 3 years already, and your server shouldn't support it either. Deadline for disabling TLS 1.0 for payment gateways and websites handling card payments was this summer. If a server still supports these then the attacker might be able to downgrade the otherwise secure connection to use these insecure protocols instead of TLS 1.2 or TLS 1.3. 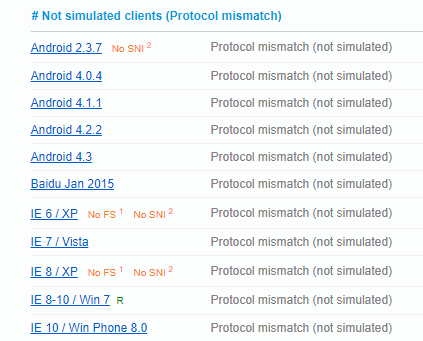 Thus it's recommended to disable them but let's check first which browsers still need these old TLS protocols. Just a few of them do, and none of them is a modern one. You can find out which browsers will be unable to access your server once you disable TLS 1.0 & 1.1 with the SSL Labs Server Test. Enter your Hostname, click Submit and wait, testing takes a minute or two. The test checks your server's HTTPS configuration, and the result should be A or A+. But at the moment, you can get A+ even if you have old TLS enabled. There are a few things that come into play here, check the rating guide. 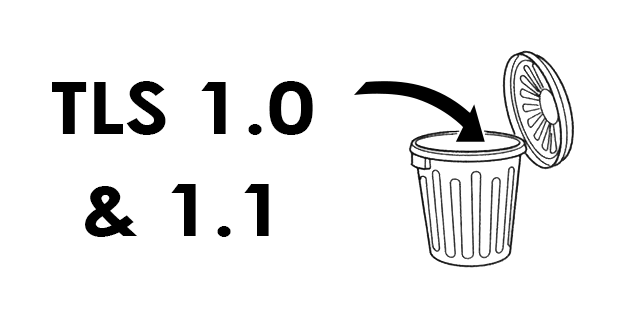 But this post is not about grades, I'll focus mostly on TLS versions below. The Configuration section starts right below the certificate info. It lists supported protocols and the Handshake Simulation table shows simulated browsers, and tells you which protocols and cipher suites they use to make a connection to your site. The “handshake” is the first phase of the HTTPS connection. The browser uses it to negotiate protocols, cipher suites, encryption keys with the server. SSL Labs simulates some 50 different browsers and shows the results of the negotiation. Checking all the lines, you can see which browsers have used TLS 1.0 or 1.1. If you don't want to or don't need to support them just disable these old TLS protocols in your server config. Slevomat.cz, the biggest daily deals site of the Czech Republic (now acquired by Secret Escapes), has disabled old TLS protocols already, so maybe you can too. Your server admin knows how to do that, there's SSLProtocol in Apache, ssl_protocols in nginx. Chrome 49 running on Windows XP can't access my site either because it requires an RSA certificate which I've stopped using. If the browser supports TLS 1.2, it also supports an EC certificate, except this one. If you need to support Chrome 49 on Windows XP you can still deploy both RSA and EC certificates at the same time, provided your server supports multiple certificates. Both Apache and nginx do. While you are at it, you can also disable unused cipher suites. SSL Labs Server Test marks some of the cipher suites as weak, and some of them even insecure, but you can disable them in your server config if none of the browsers you wish to support requires them. My server offers just 5 cipher suites, and I've used Mozilla's config generator with the “Modern” profile to configure them.